We know she's pretty, but who IS she? 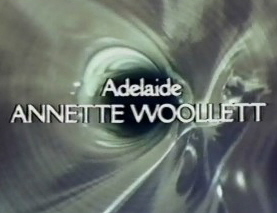 Information regarding Ms. Woollett which can be located online is rather sketchy, with no true biographical facts seemingly available. 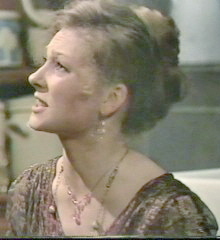 All I have ever located is other career information, which tells that aside from playing Adelaide she also appeared in two episodes of the "Thriller" anthology series, an episode of Upstairs Downstairs, and in an unspecified number of number of episodes of the UK soap "Emmerdale Farm". Should any readers know more details, personal or professional, please contact me via the given e-mail address and they will be added with a grateful immediacy! "I was one of Annette's first boyfriends and she was lovely even then though a bit wacky like any actress. She lived in a huge mansion in Worplesdon, Surrey near Guildford, the daughter of wealthy professional parents. She must be about 52 years old even though she always looked young for her age; partly because she is only 5 foot 2 inches tall. I was dating her in 1970 when she was driving so she was at least 17 then. She was a great laugh and she moved to Notting Hill in 1971 when she made her first TV appearance holding a gun in the Avengers. I wish her all the very best. Thanks very much, Nigel, for the information and affectionate, if brief, reminiscence. I believe that her appearance on The Avengers has not been heretofore noted online: not even in the hallowed megabytes of the Internet Movie Database! Any more information I receive shall be happily posted, as well as happily received! "I was amazed to come across your website, and also to read the message from "Nigel". Well, I can trump his claim to be one of her first boyfriends as I dated her in 1968. She went to Tudor Hall girls' school near Banbury, and I went to the nearby boys' public school, Bloxham. Both schools still exist although mine nowadays also has girl students - wow! Best of luck with your forthcoming biography of her!